Simply put: If you have invented something novel, non-obvious, and unique, filing a patent application for your invention may be best way to protect it. 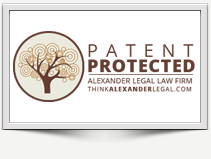 At Alexander Legal, our patent services are based on legal experience and expertise that you will not receive from non-law firm businesses such as Legal Zoom and the like. The process from invention to patent can be challenging. Alexander Legal’s team provides high-quality, professional and personal legal service that you will not receive from a $149 filing fee bulk patent application service. Our available patent services include: patent searches, State of the Art Reports, patentability opinions, preparing and filing patent applications, and patent prosecution. We can help you determine if you have invented something that could be eligible for patent protection. After preparing and filing your patent application, we will follow your application through the prosecution phase, working directly with a United States Patent and Trademark Office (USPTO) examiner. Our goal is the successful grant of your patent. Our low $225/hr. rate ensures you are getting better value at our intellectual property boutique than you would at a larger law firm. We will work with you to figure out an affordable budget to achieve your patent protection goals. Take the first step toward getting a strong and enforceable patent granted for your invention by contacting us today for your FREE initial consultation. Patent law is the second of two areas of law recognized by our Founding Fathers in the United States Constitution. A legally issued patent that is properly maintained will expire at the end of 20 years. Before making the decision to invest in the patent process, our Atlanta patent law attorneys can provide you with a patentability opinion. We will extensively research prior art to determine if your invention is new, useful, and non-obvious. We will provide you with our opinion as to whether or not the United States Patent and Trademark Office (USPTO) is likely to grant you a patent for your invention. Our Atlanta patent law attorneys prepare and file both provisional and non-provisional applications. A provisional patent application is a preliminary, less expensive step that allows you to use the phrase “patent pending” on your invention and establishes your priority date. Once filed, the provisional patent application allows you twelve (12) months to file the required non-provisional application and claim your priority date benefit. Under the America Invents Act (AIA) first-to-file system, it is an option worth considering. It no longer matters if you were the first to invent. If someone else also thought of the same invention and they filed with the United States Patent and Trademark Office (USPTO) before you, you could be out of luck. Provisional patent applications are a useful tool for the budget-conscious. Whether you first file a provisional patent application or choose to file a non-provisional application instead, our patent lawyers will work directly with you to ensure that all eligible aspects of your invention are included in your patent application. Preparing and filing your patent application is only the first step in the patent prosecution process. Once your non-provisional patent application is filed, a U.S. Patent and Trademark Office (USPTO) examiner will evaluate your non-provisional patent application to determine whether your claims for your invention are patentable. The patent prosecution process is an interactive one between us and the USPTO examiner. Our Atlanta patent law attorneys will work diligently to protect your best interests and build a thorough file history that will help to ensure that your issued patent is strong and enforceable.